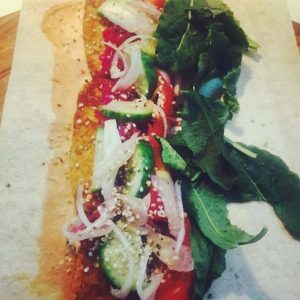 In a spelt mountain bread wrap I have a scrape of byron bay miso topped with chickpea tempeh by Byron bay tempeh, cucumber, eschallots I cooked with the tempeh in coconut oil, #madeinhemp Canadian hemp seeds, tomato, pickled beetroot/red cabbage by #alivefoods and baby kale. Ready for take off. Of course have it for lunch if ur not ravenous upon waking like I am.